First impressions matter. And you can’t bank on second chances. On the lot vehicle promotion and presentation is a basic building block for any successful retailer. And it all begins with professional, easy-to-maintain window labels. As part of our on the lot inventory service, we provide the buyers guide to fulfill the legal requirement as well as a detailed and informative list of options and selling point for that vehicle. 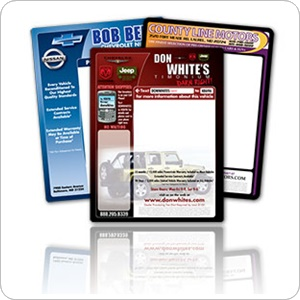 Pre-printed dealer-specific marketing labels using UV smudge-resistant ink. Stickers remain bright and easy to read even under harsh conditions. Custom designed window stickers available. Salespeople showing the car have detailed talking points as they demo the vehicle to a customer. Market the vehicle to shoppers walking your lot after hours giving them detailed vehicle information. Include a CARFAX© Vehicle History Highlights on each window sticker. Print QR Codes to refer customer directly to vehicle details. Language-correct Spanish versions for use in conjunction with English versions, where required. Our Buyers Guides keep you compliant with FTC regulations, display dealer state-specific warranty information and can be customized to include dealer-specific warranty data, as well as information pertaining to “Certified” programs. Federal and State compliance on manufacturer and aftermarket dealer warranties, including “Systems Covered” information and “Duration” statements. Comprehensive pre-owned balance of factory vehicle warranty matrix for all year, make, model, and trim combinations. 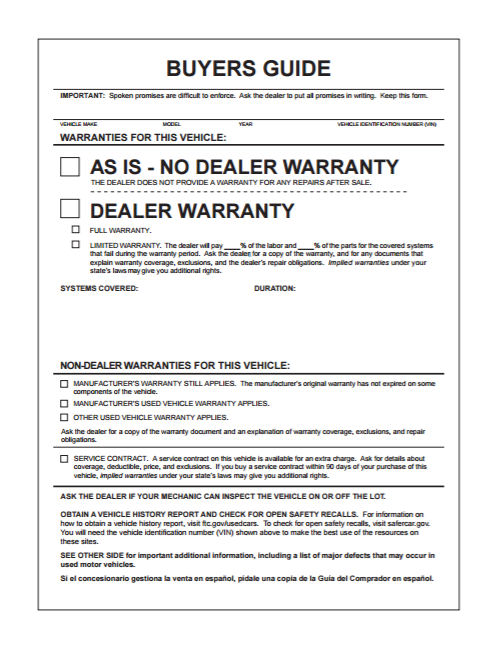 Customizable dealer warranties auto insert for the appropriate vehicles. 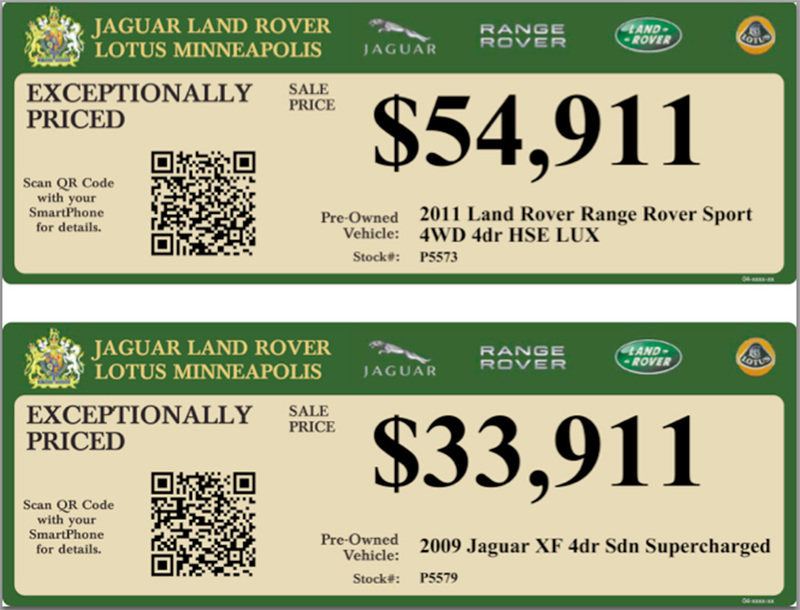 Certified Pre-owned vehicle labels, including optional warranty information, specific to all “Certified” programs. Spanish language translations: these are not just generic translations, but legal translations of the English versions and vehicle information for each vehicle. The day-to-day energy, effort and expense involved in selecting and prepping vehicles for display on the lot adds up: Grease pens ($), oil based markers ($), decals ($), factory stickers ($), paper hang tags ($), die cut decals ($$), angled model year stickers ($)… and what about vehicles that stick around for a while that get a couple treatments? Our Hang Tags + app allows dealers of all sizes to easily and inexpensively design, create and print engaging stickers and decals. Stickers can be used to present content about mileage, price, payment, and more. And replace the numerous pre-printed tags and templates lying around that you hand-write today. Hang Tags + prints adhesive labels in almost any size and shape with your branded content. Every label is a durable, weather resistant vinyl (no fading, no peeling, no cracking) and all are “easy on/easy off” for fast application per vehicle. Plus you can print your vehicle data onto the labels using any laser printer in your facility.